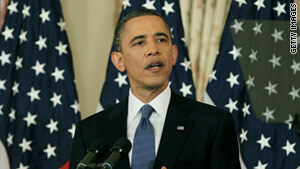 U.S. President Barack Obama has called for a Palestinian state based on pre-1967 Israeli borders. (CNN) -- The Arab League plans to ask the United Nations to grant full membership to a Palestinian state based on borders with Israel that existed before the 1967 Middle East war, according to the state-run Qatar News Agency. The move comes after President Barack Obama made official the long-held -- but rarely stated -- U.S. support for a Palestinian state based on those borders, a position that Israeli Prime Minister Benjamin Netanyahu has said can never happen. The 22-member Arab states will seek membership for a Palestinian state -- with East Jerusalem as its capital -- during the next United Nations session in September, according to a statement released through QNA Saturday by the Ministerial Committee on the Arab Peace Initiative. The committee vowed to "take all steps and make the necessary contacts to mobilize the support required from the Security Council members and political and geographical groups in the United Nations to ensure the issuance of this resolution," the statement said. Palestinian goal now a U.S. position? The committee opted to make the request after Netanyahu told U.S. lawmakers last week that Israel will never return to pre-1967 boundaries. In a speech before Congress, Netanyahu said he was prepared to be "generous" in regard to the size of a Palestinian state but that Israeli security will be a major consideration in the establishment of future boundaries. In a speech last week, Obama became the first president to formally endorse the policy, but he also acknowledged the need for modifications through the negotiating process due to conditions on the ground. Netanyahu has blamed Palestinians for refusing to recognize the Jewish state's right to exist, and he repeated his demand that Jerusalem remain united as Israel's capital. The Arab League committee blamed Israel for the failure of the peace process, saying it had tough policies toward Palestinians, rejected a two-state solution and settled East Jerusalem, according to the statement. The committee also "urged the U.S. Congress to review its positions and balance them to uphold the U.S. interests and role in achieving peace," the QNA statement said.